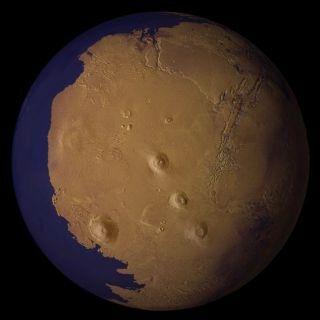 A view of Mars as it might have appeared more than 2 billion years ago, with an ocean filling the lowland basin that now occupies the north polar region. Evidence of liquid water on the surface of Mars roughly 3.8 billion years ago implies that although its surface temperature now averages -51 degrees F (-46 degrees C), it was once relatively warm. Scientists have often proposed the red planet was enveloped during its youth in an atmosphere rich in carbon dioxide. Carbon dioxide is a "greenhouse gas," meaning it traps heat from the sun, warming up worlds such as Earth. However, past findings suggest "that no amount of carbon dioxide on its own can get early Mars above the freezing point of water," said Harvard University planetary geochemist Itay Halevy. Also, an atmosphere rich in carbon dioxide would have led to massive deposits of limestone and other carbonate rocks littering the surface of Mars. The absence of such rocks has been a major puzzle. Now Halevy and his colleagues propose in the Dec. 21 issue of the journal Science that volcanic gases loaded with sulfur could help solve both the puzzle of the missing rocks and the mystery of how Mars got warm enough for oceans. The surface of Mars contains much higher levels of sulfur than Earth. This brimstone came from volcanoes that once erupted on the red planet. Indeed, the largest volcano in the solar system, Olympus Mons, is on Mars. Compounds such as sulfur dioxide and hydrogen sulfide in volcanic gases could have acidified the ancient oceans of Mars enough to prevent the formation of carbonates, thus explaining their absence on the surface, Halevy said. In addition, sulfur dioxide is a potent greenhouse gas. If the atmosphere of early Mars was a hundredth or even a thousandth of a percent sulfur dioxide, that might have been enough to warm the red planet up for oceans. Halevy noted that Earth and Mars were quite similar in their early days, and that sulfur dioxide could explain the scarcity of carbonate rocks on our planet during the Archean eon roughly 4 billion to 2.5 billion years ago. "This has implications for how life originated on Earth during that period," he told SPACE.com. "Were oceans more acidic than at present? This raises a lot more questions." Further experiments and computational modeling is needed to support these ideas, Halevy added.